CD booklet in english / german ! Look at the press reviews below ! Funk-, Rock - and Pop-Grooves (Playalongs) all 12 keys are dealt with. The scales you can use for your improvisation, you will find in the CD-booklet ! The playbacks are within itself diatonical, that means each playback is within itself closed in any key! This CD is a must not only for guitarists but also for saxophonists, trumpeters, pianists; in short, for all those who play a lead-instrument and who would like to improve their abilities of improvisation.
" With the help of this production the one practicing can focus on the harmonic surroundings, while improvising, and that way develop the ability of playing solo. Already, the first Track in C-major has despite its simple harmonies a good sound so that even beginners can deal with it easily and develop their abilities with the help of the CD.
" The CD sounds very good and "fresh" and not at all artificial. The songs are varied and stylistically diversified." And further on: " With 12. - Euro the CD is well-priced", as well as: "conclusion: a promising approach, which should not be endangered by copying this CD in view of the truly favorable price." "... No dry practice-patterns but lovingly arranged and well-composed pieces in many different styles and tempos, which work as ideal scenarios for your own fantasies as a soloist..."
" Whether for instruction, for trying out new ideas or simply for letting of steam - these playbacks deliver a groovy, vivid and well sounding playalong, as one can only wish for as a soloist. With the push of just one button each key and style from pop to rock is available - wonderful "! 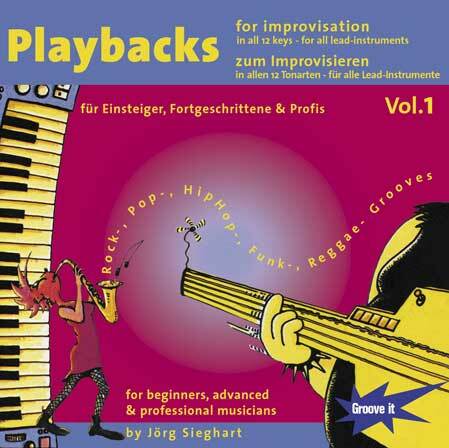 Jürgen Birlinger - highly considered Singer/Songwriter, guitarist and music-teacher - says: " With different stylistics of rock and pop-music, this CD offers very well done playbacks for improvisation. Here, beginners as well as advanced musicians can experience themselves as frontman of a modern Rock/Pop-Band and enlarge their instrumental proficiency in playing solo. A modern orchestration and up-to-date grooves provide a lot of fun. Moreover, this CD is an absolute enrichment for the progressive instrumental-school! Well tempered and motivated students, who are finally allowed to rock and who have the possibility to try out what they have learned under real conditions, prove it....Good that there is" Play-A-Long " CD, now, for future rock- and popstars! " " Ahem, because of playing around on my guitar I had almost forgotten to write this review. If a Playback-CD can distract that much, that is a good sign. .......................... A sonorous, diatonical carpet is created by percussion, rhythm-guitar, bass and keyboard, to which soloists can play and let off steam. ................................. .Now, please excuse me, I would like to keep on playing to track 14, reggae in G-major." " The effect of learning exceeds by far only the stylistic one: That way trumpeters and saxophonists must also deal with, from their point of view, inconvenient guitar-specific keys like E-major or A-major, while the guitar-playing colleagues should also play their solos over the typical keys for brass, which is very useful for the ability of playing." And further on: " There is no need to argue about the quality of the production........Instrumentalists of each couleur can let off steam at home and can appear in the rehearsal without being upset. And that is really a good thing ." "Something that was missing until now are Exercise-Playbacks for the Pop/Rock section, which introduce the practicing one systematically into the matter and accompany him through the different harmonies and keys. 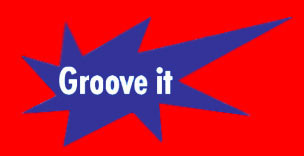 With Groove it - Playbacks Vol.1 Jörg Sieghart has filled this gap in the market, successfully. And further on: " More CDs in the playback-series are due to follow... ... we are curious and pleased with Jörg Sieghart`s commitment, which enriches the market decisively." " The investment is worthwhile for each band ". E-Gitarre lernen mit Lehrbuch "Electric Guitar"